Throughout the silent era, sheet music for cinematic-inspired tunes brought together the public’s fascination with the silver screen, and their love of popular music. 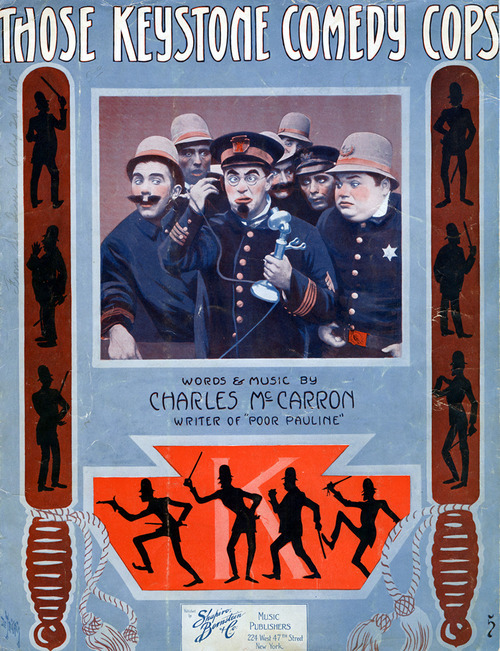 Written by Tin Pan Alley songwriter Charles McCarron in 1915, Those Keystone Comedy Cops capitalized on the popularity of bumbling policemen who had been introduced by Mack Sennett just a few years earlier, but had already become audience favorites. Illustrated by Hungarian-born artist André De Takacs, this beautiful sheet music cover makes subtle reference to the world of moving pictures. The focal point includes a photo from the film In the Clutches of the Gang, featuring Ford Sterling and Roscoe Fatty Arbuckle. This tinted image mimics a movie screen, while the Keystone company logo glows behind dramatic silhouettes of stylized policemen. The silhouettes are also depicted on the two oversized billy clubs adorned with tassels that frame the image like theater curtains, evoking the elegant movie palaces of the era. This item is one of hundreds of pieces of silent-era sheet music donated to the Margaret Herrick Library by Robert Cushman, and archived in Special Collections. Other examples of silent-era sheet music may be viewed in the library’s Digital Collections. The library is also home to the Mack Sennett papers featuring scenarios, production materials, and photographs relating to the career of this prolific producer. While In the Clutches of the Gang is believed lost, the Academy Film Archive preserved a fragment of the production, recently discovered at the New Zealand Film Archive, as part of the New Zealand Project. This iconic music score is one the treasured artifacts to be featured in the new Academy Museum of Motion Pictures, scheduled to open in 2017. This entry was posted on Tuesday, December 3rd, 2013 at 12:02 am	and is filed under Blog by Manny Pacheco. You can follow any comments to this post through the RSS 2.0 feed. Responses are currently closed, but you can trackback from your own site.